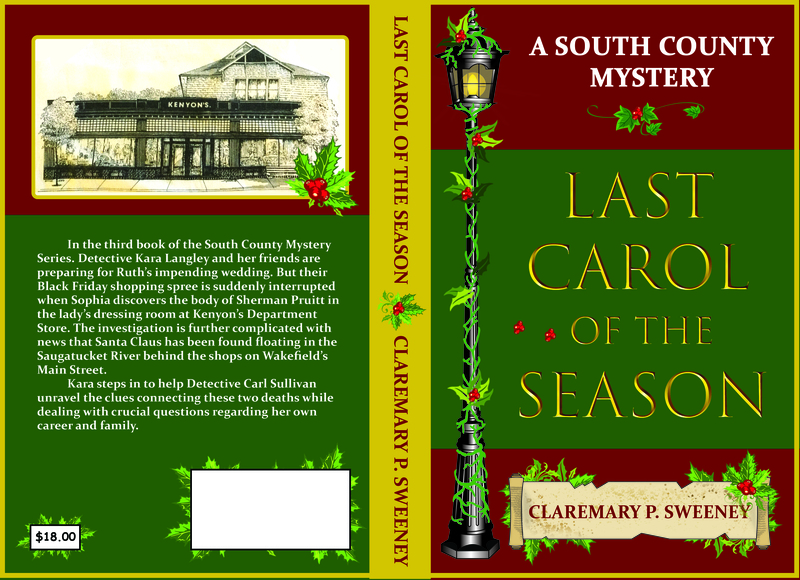 I’ve just completed writing the third book of my South County Mystery Series, Last Carol of the Season. Of course, writing’s the easy part. 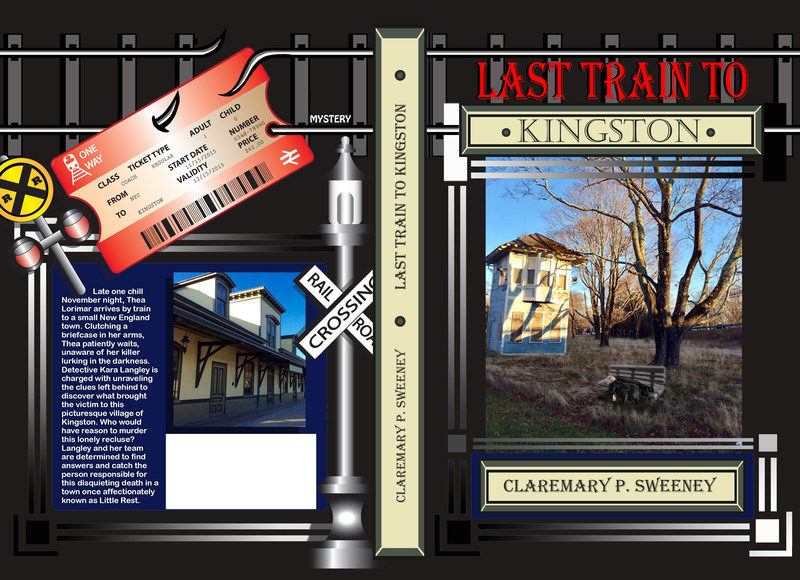 Now begins the editing, formatting, proofing, and myriad assorted tasks necessary in bringing a book to publication. I’d never really intended to do a series. 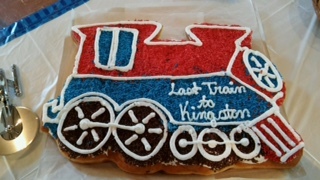 Last Train to Kingston was written to appease my Rhode Island friends who felt I should show some loyalty to my own state. I’d been writing children’s stories set in the Berkshires of Massachusetts and my RI audience wanted something local. I had no idea that first mystery would be so popular. But still, my RI fans were not appeased. They wanted another book with Detective Lieutenant Kara Langley investigating and solving crimes right here in our own back yard. So, I wrote Last Rose on the Vine and set it right here in Kingston at the University of Rhode Island. It launched in April and sales are doing well. Now, I don’t need to be hit over the head (like poor Thea in Last Train) to know I’ve got a good thing going and there are three more towns here in South Kingstown, Detective Langley’s purview. I think Last Carol is my favorite so far. It’s set at Christmas time in Wakefield, the village I first moved to when I decided to live in South Kingstown. Although the underlying theme of the book involves abuse, alcoholism, and the effects they have on families, there is much joy in the pages of this book. A wedding is being planned. Parties, gift shopping, decorating, baking, holiday traditions are all intertwined and every chapter title is taken from a line or two of a favorite Christmas Carol or Hymn. The words in the lyrics form a motif around which the scenes in each chapter revolve. And of course there is the local history and settings which thread through the plot as the mystery unfolds. 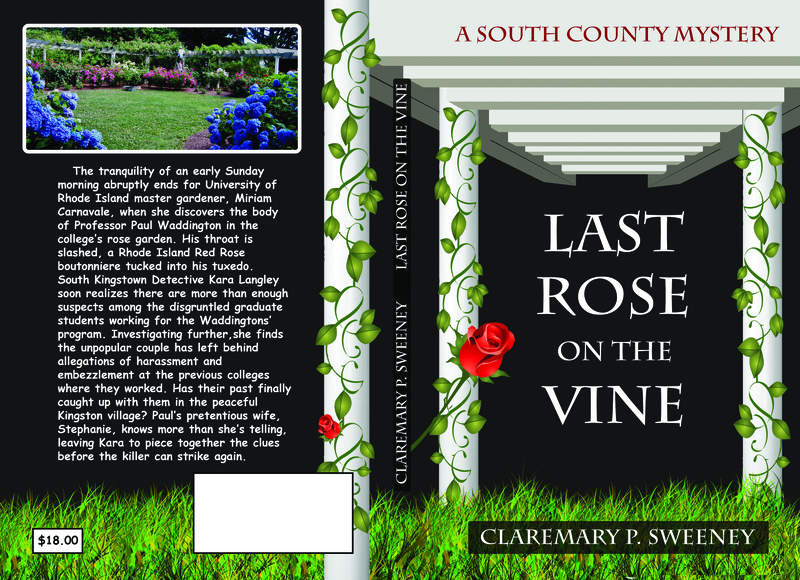 I’m sorry to see this one end but I’ve already begun writing the fourth book, Last Sermon for a Sinner, set in the village of Peace Dale. Tonight, I’ll be discussing the South County Series at our town library. It’s going to rain and I’m not sure how many people will attend, but I enjoy talking about the characters I’ve created and the familiar settings included in each book, so if one person shows up, I’ll be happy. Wow, congratulations with your new book! Oh yes, the most difficult is awaiting for you yet. I am trying to publish my first book for several months already and still have technical issues to fight against! It gets easier each time because I’m good at learning from my mistakes. (and I make a lot!) Be persistent – it only will serve to make you tougher – and tougher is better! Congratulations 🙂 I love the cover for Last Carol of the Season and it sounds like an interesting story. As you say, that’s the easy part out of the way and now you have the hard part in front of you! Good luck. I hope the talk went well and a few folk braved the rain to come and hear you. Mary,I believe you have had quite a lovely summer in Scotland. I’m sorry we did not plan a trip to the Bonny Isle this year but will definitely fit one in during 2019. Hi Ethel, Wow!! All those lasts are wonderful ones!! I had a twinge of anxiety, when I read your title. What lasts were you talking about?? Whew, anxiety banished. Hi Roxie!! How ya doing, love?? Lucy, Well, now I’m in the middle of it and will probably be writing books for this series until I’m well into my dotage! I thought you’d like the photo with Roxie helping Zach with his design work. She sends her love, too. You have really been busy with all the “lasts.” You’re so passionate about your work, Clare, and you appear to be building a fan base. I agree with you that the writing is the “easy” part because marketing and publicizing, etc, demand a completely different kind of mindset. Zach’s work is equally gorgeous – you two compliment each other perfectly. Hi, Sharon, Great to hear from you and thank you. Right now, it’s 2:20 AM and Zach and I have been working on the cover design for two hours by email. He’s as nutty as I am! We’re having problems with decorating the lamp post. We’ve tried garlands of holly, pines, lights, etc. Nothing is working! I think I need some sleep. I like the ivy but maybe try less of it. It doesn’t have to wind all down the entire length and around the top. Maybe a sprig would do. The rest of the image is very effective. You might try reducing the intensity of the green so that the red pops a bit more. As it stands now, the value and amount of the red and green are nearly equal, so they’re competitive. That would allow the title to shine brighter as well. Whether you choose consider my suggestions or not, please strike this comment. It’s only for your eyes and Zach’s. And now all of us should go to bed! oops – I guess it’s holly, not ivy. Ahhh! and that’s the rub! Zach is not very good with greenery. We are working through this and finding alternatives. Thanks, Shari. Congratulations! Like purpleslob I had a twinge of anxiety when I saw the word “Lasts”, but the news is all good! And I’m glad to see that Roxie has such a talented table-mate. The covers look great. Hello! A few others commented on my title choice which I realize could have been seen as a Good-bye to blogging. But, no, tales of my demise have been greatly exaggerated (Twain – kind of?). I’m back among us and will have much catching up to do with your blog. Roxie is waiting for me to read your posts aloud and hopes no other cats have been axed in the interim. Cats keep their heads. It’s the people you need to worry about. Hi Clare. Great to see a new post from you – it appears you’ve been a little busy of late! I hope all went well last evening and you had an audience of more than one! Congratulations Claremary. Great stuff. I love how you just forge on. My best to your, my friend. Thank you, my friend. Yes, we’ve both been busy with our books and that is really good news. I find escaping into murder mysteries is a respite from all of the political chaos wrought by the fake president residing in our White House. Canada is looking very good to me right now. Take care and keep in touch. What would we do without our writing, eh Claremary? I know I would be lost for something to do. Got arthritic fingers or would be doing some wood carving / small scale clay modelling. And, yes, Trump scares the hell out of us – but makes us resolute. Osyth, I hope New England is treating you well despite the political news we are accosted with every day. I know last year was filled with changes for you and am glad this has all finally settled down. I’m finding that plotting murders within the pages of a book is very cathartic these days. It must be interesting for you to view the political scene from three perspectives: England, France and right here in the middle of it all. Take care and if you are planning a visit to South County, make sure you make some time for me. New England is a gracious lady who treats me most kindly – warm and friendly and kind and generous which is really what one wishes the world would just be. Viewed as a newbie, I find the politics here absolutely unconscionable but I know that is not wholly that I am viewing as a Franco-English woman. The fact is that most everyone I speak to here feels the same. As I know you do. A combination of absolute white rage and abject horror. I am sure I will be pottering to Rhode Island before the year closes and I will absolutely be sure to give you warning. I am glad your books are proving cathartic. That is what writing should be … succour for the soul of the author. How wonderful to hear a little more about what you’re working on, and to see your terrific progress. You’re inspiring, Clare! I love the cover. Great job, guys 🙂 And good luck with all the work of publishing a book. Clare, what an achievement! I think Last Carol was my favourite too. You just get better with each one. I hope the library talk went well. Hi Clare – I miss you and hope you post again soon. Always love seeing what’s going on at your end of the prairie. Hope all is well with everyone. Hi, Sharon! All is well. I’m getting the first mystery ready as an ebook, formatting the third mystery for publishing in paperback and writing the fourth mystery of the series. And it’s the busiest time of year for sales. But I intend to take time to write a blog post very soon.